2011 MLB Postseason: Can the Brewers Sweep the Diamondbacks? After the first two games of the National League Division Series between the Arizona Diamondbacks and the Milwaukee Brewers have resulted in victories for the Brew Crew, the series now heads to the desert for game 3 with Milwaukee having the opportunity to complete the three game sweep. Will they be able to advance to the NLCS on Tuesday night? One cannot forget how good of a home team the Arizona Diamondbacks are, one of the best in baseball. And this has been a D'Backs team that nobody has taken really seriously all year and have flourished under the radar. But to be honest, I think the Brewers are going to finish the sweep on Tuesday in Phoenix. Their bats are getting clutch hits and are driving in runners that are in scoring position, as proven by their sixth inning on Sunday where they scored five runs to pull away. 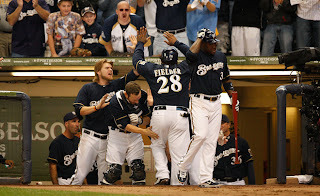 Ryan Braun, Prince Fielder and co. are getting the job done at the plate and they have all the confidence right now. They will throw Shawn Marcum on Tuesday and while he has just as much playoff experience as Diamondbacks rookie Josh Collmenter, he has had success pitching on the road this year, more so than at home. I haven't seen any reason in the first two games why the Diamondbacks will come back and make this series. Granted I've been proven wrong many a time but I'd put my money on the Brewers in game 3.